What Should Be Included in Balanced Diet? Healthy eating doesn't mean you should impose strict dietary limitations to stay unrealistically thin. It's about sticking to a balanced diet to feel great, improve your outlook, have more energy, and be in good mood. Yes, what you eat will have an impact on how you think and lead your life. It is therefore important to understand what you should eat, what you should not, and what you can eat but in limited proportions. Generally, you can eat a variety of food, but you need to know how much of it is healthy to eat, which helps maintain a healthy weight and keeps you fit. 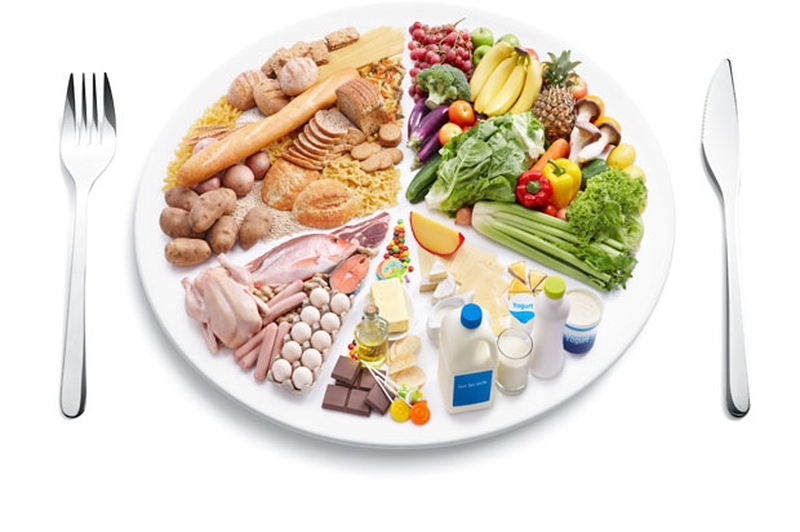 A balance diet will have different food items from different food groups. Your diet will usually be based on starchy foods, such as pasta, rice, vegetables and fruit. It will also include protein-rich foods, such as fish, meat and lentils, with some dairy products. You will have to limit the intake of salt, fat, and sugar. It is not easy to determine which food is better and how much of it will provide you with maximum benefits. With that in mind, we've listed some of the most beneficial foods with daily recommendations to help you design your own balanced diet with ease. Fruits and veggies provide your body with minerals and vitamins. Thanks to their high water and low fat content, they help keep you hydrated and prevent illnesses. Eating whole grains help maintain healthy weight and reduces the risk of diabetes as well. You need protein for stronger hair and nails. It also helps repair nerve cells and heals injuries. Dairy provides you with calcium, which is important for strong teeth and bones. It also helps regular your muscle contraction. It is especially important for women to prevent bone related illnesses and injuries. A third of each meal should contain carbs. Women should eat 25 g of dietary fiber a day, and men should have at least 38 g per day. Carbohydrates release energy slowly to keep you charged throughout the day. Whole grain carbs are the best. Your diet should also contain fiber, which decreases risk of colon cancer, coronary heart disease and death. Fat is good when consumed in small amounts because it's essential for the transportation of vitamins A, E, D and K. It also supplies your body with essential fatty acids that help improve your immune system. You cannot ignore the importance of balanced diet, and you don't have to go through a lot of hassle to design one on your own. Here's what you should have in your diet daily. Fruits and veggies don't contain many calories and are packed with minerals, vitamins, fiber and antioxidants. Be sure to have at least five servings each day to keep you fill and reduce the urge to eat unhealthy food. Eat rainbow vegetables and fruits every day because deeply colored fruits contain more minerals, vitamins and antioxidants. Add more berries to your breakfast, and snack on snow peas, carrots or cherry tomatoes. Opt for healthy fiber sources, including whole grains to keep your batteries charged all day long. Whole grains contain antioxidants and phytochemicals that keep you from certain cancers, coronary heart disease and diabetes. You need protein to keep yourself energized. How much protein you need usually depends on your body weight. Adults should have at least 0.8g of high quality protein per kg of weight. Avoid red meat though and opt for chicken, fish and plant-based protein, such as nuts, beans and soy. You may also add seeds, chicken, tofu, nuts and low-fat dairy. Dairy is a great source of calcium and is important for your bones and teeth. You may want to avoid dairy products if you are lactose intolerant. If that's not the case, you should opt for low-fat versions. You can drink 250ml soya-milk or 200ml milk, or 30g of cheese more often. If you cannot eat dairy, you may want to switch to calcium-fortified yogurts and soya milk, as well as dark green leafy vegetables such as spinach and broccoli. You should add healthy carbs to your diet, which should include fruits, beans and vegetables. Adding millet, brown rice, whole wheat and barley to your diet is a good idea. Dietary fiber is important as well because it helps lower the risk of stroke, heart disease and diabetes. The best sources of fiber are wheat cereals, oatmeal, barley, nuts, beans and vegetables like celery, carrots, and tomatoes. Your body needs fat and sugar, but you need to understand how much is enough. The recommended value for sugars for an average adult is 90 grams. Too much sugar may lead to depression and diabetes. Limit the use of deserts and candies and learn to identify sugar hidden in food such as frozen dinners, mashed potatoes, fast food, low-fat meals and ketchup. Be sure to reduce sugar in your diet slowly to avoid dealing with cravings. Similarly, you need fat to nourish your heart, brain and cells, as well as your skin, nails and hair. The recommended value for fat for an average adult is 70 grams. You should consider adding monosaturated fat in your diet – this includes plant oils like peanut oil, canola oil, and olive oil, as well as nuts, avocados and seeds such as sesame and pumpkin. Server responsed at: 04/24/2019 4:27 p.m.